The PowerPot X is a pretty good name for this new device, as it is basically a pot that provides electricity. 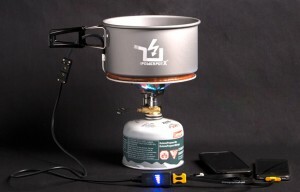 You pair it with a camp stove and thermoelectric modules on the bottom of the anodized aluminum kettle can give 10 watts to the PowerPot’s dual USB ports. The creator says that this is enough to charge one iPad or two iPhones. The PowerPot comes in two sizes: The 4 quart PowerPot XL and the 2.4 quart PowerPot X. Other products like this have been popping up on Kickstarter like the FlameStower, which is basically the same thing but a little bit smaller with a little less power. To make sure that your iPhones get an even, predictable flow of electricity, the power passes through a regulator before it reaches the USB ports. The regulator also has a built in power meter with LED lights arranged in a triangle design that shows how much power is flowing. Currently, the Kickstarter campaign has raised more than it’s goal of $30,000 and still has 36 days left. It is set to start shipping out in May 2014. The new Apple iPhone 5s has a pretty great camera with a redesigned lens and dual LED flash, it is certainly capable of taking “acceptable” photos in a low light setting. But what about situations where that isn’t enough? The Lightstrap is a nifty case that has a built in flash that wraps all the way around the back of the case. It is built to mimic a professional flash ring that photographers would use. This type of flash will allow you to take much higher quality low light photos, and it pops right on the back of your iPhone and protects it just like any other case. It even looks good. The Lightstrap lets you get pretty in depth. You can choose from seven brightness levels and six different color temperatures. The flash is 10 times brighter than the one built into your iPhone 5s, 15 times brighter than an iPhone 5, and 30 times brighter than the 5s’s video mode LED. The Lightstrap has its own built in 1000 mAh battery, and on a full charge can take about 500 photos or about 30 minutes of video. It can be recharged with a standard USB cable. The 16-millimeter thick, 2.5-ounce accessory does not require a specialty camera app — Lightstrap is triggered by the iPhone’s built-in LED flash. The retail price will be $97 dollars and it is set to ship out in April of 2014. It’s time for some more Apple rumors! The iPhone 5S and 5C are still fresh in our minds, it still feels like they came out just yesterday. But Apple has already spent hundreds of millions on the production of the iPhone 6. Here are a few more rumors going around about what we could be getting next year. 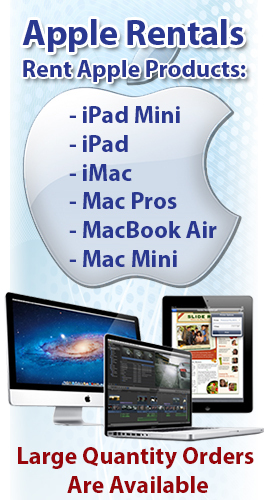 It has been confirmed that Apple has not only teamed up with PrimeSense, but they bought the whole company. PrimeSense is the same company that built the technology behind the Xbox Kinect motion sensor. It is said that Apple has already spent over $350 million dollars on the Israeli company. Rumors of the purchase have been around for a while, and everyone automatically assumed that since Apple bought the company that they would be putting the new technology into a new TV. But it is starting to look like they will be looking beyond that and using the technology for a few new things, including the next iPhone release. PrimeSense has refined their technology and has been able to make it so small that it actually could fit inside the next iPhone and bless it with new 3D sensing capabilities. If this is the case then people will be able to take pictures of any object or person and the camera would be able to determine the size and mass of the object. It seems like old technology that no one would care about after phones like HTC’s EVO 3D, but this goes even deeper. The new iPhone would be able to actually take pictures of items and measure them. For instance, if you need a new couch, you would be able to take a picture of your current one and your phone could give you suggestions on new ones that would fit in the same space. How neat? 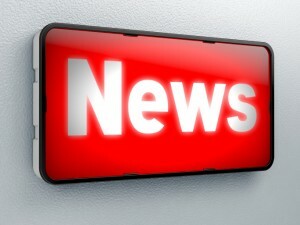 It has been reported by the Korea Times that Apple is working on a new iPad with a 12.9 inch retina display. The current iPad Mini is 7.9 inches and the original is 9.7 inches. So, this would be a huge jump in size. This is reportedly expected to hit stores in the later part of next year, around the time that we would be seeing a new iPhone release. The fingerprint reader in the home button of the iPhone 5S is still pretty fresh. Lots of people love it, but others can’t seem to get it to work for some reason. According to new reports, Apple filed a huge patent application with the World Intellectual Property Organization showing that they want to turn the Touch ID into a trackpad. If this happens, people would be controlling their iPhones by twisting their finger over the home button. You would slide your finger left or right and the map display on the screen would scroll in the same direction. You would also use this to scroll while using the browser. Kind of seems like old BlackBerry technology to me, not that exciting. And as it turns out, I’m not the only person who thinks that. Do you think that a trackpad would be a step backwards for Apple? Other rumors for the iPhone 6 include a full front display with no borders. It is said that the new display is going to be made with sapphire glass, the same glass used on the touch ID. Apple has reportedly spent a few hundred million on just the development of the machines needed to make high volumes of the glass. An upgraded camera, external flash compatibility and 128GB storage are also all on the list of rumors. Apple is a little bit late on the wearable game, but that might give them the advantage. Seeing where other companies are falling short and applying the knowledge to make a superior device could prove to be fruitful. Mass production of the new watch is said to be in full swing by early to mid 2014. RentOurTablets.com is a nationwide provider of short term tablet rentals for meetings, conferences, trade shows, and other short term projects. To learn more call 800-736-877 today!